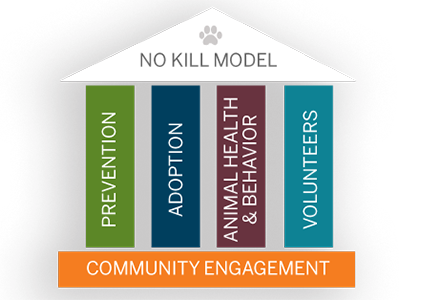 Rescuing homeless pets and uniting them with loving families through a robust and visible adoption program is essential to building a No Kill community. Creating more opportunities for animals to meet interested families is one of the best ways to end the killing of today’s at-risk pets. Thanks to our adoption centers, off-site events and innovative programming, 5,591 animals found loving homes in 2018. The best way to expand awareness is to make homeless pets visible. Taking homeless cats and dogs to high-traffic areas, either through adoption events or permanent adoption centers that are bright and welcoming, is an important way to reach a broader audience. But those efforts must be complimented with a robust media and social media strategy as well.PAWS Chicago works every day to expand the visibility of homeless pets to increase adoption. That was our approach from the very beginning, when we launched the first Angels with Tails event. Today, we continue to host large-scale Angels with Tails adoption events each year. We also host offsite adoption events almost every weekend, bringing pets to high-traffic shopping centers and retail stores where people will stop, play and think about adopting. But we have a permanent presence, too. When building our Adoption Centers, we looked for locations central to where people live, work and play. We revolutionized the sheltering of Chicago’s homeless animals in 2007 with the state-of-the-art, cageless Pippen Fasseas Adoption Center. In late 2014, we expanded our footprint with the Glenn L. Felner North Shore Adoption Center in Highland Park. 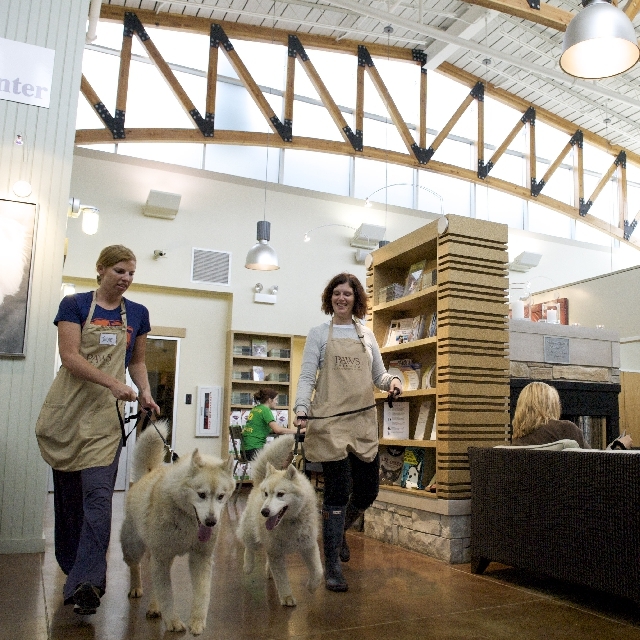 The Pippen Fasseas Adoption Center, which opened in 2007, redefined animal sheltering as the first cageless, state-of-the-art, No Kill shelter in the Midwest. The Center was designed to reduce stress for animals awaiting new homes and provide 100 percent fresh air flow to prevent disease transmission. The Center includes the Barbara Bradford Kitty City, a kitty’s paradise, with designated age-specific rooms and separate condos for felines who prefer “privacy.” In the Marshall Field Family Dog Town, volunteers provide canine residents with at least five walks a day, as well as playtime on the rooftop deck and training to prepare them for adoption. Innovative on-site adoption events held at the Adoption Center, including the Spring and Holiday Adopt-a-Thons raise awareness and bring in the community, resulting in more lives saved. PAWS Chicago’s first satellite adoption facility—the Glenn L. Felner North Shore Adoption Center—opened in December 2014 in Highland Park. The opening of the Felner Adoption Center represents an important step in PAWS Chicago’s mission to expand lifesaving and build No Kill communities. The mission of the new Felner Adoption Center is to help find more homes for pets in need—especially large dogs popular with suburban families who are often overlooked in the city—and to bring our progressive sheltering practices to a new community of adopters. Located inside the Highland Park Petco, in 2018 the North Shore Adoption Center was responsible for 430 of our adoptions. On May 30, 1998, PAWS Chicago was launched with its first event—Angels with Tails Michigan Avenue.By working with stores along the Magnificent Mile and inviting Chicago’s animal shelters and rescues to participate, we broke the silence surrounding the death of thousands of homeless pets by taking the message to the streets and in the stores, and showing off the wonderful pets in need of homes. Each summer, PAWS Chicago continues to host Angels with Tails events. In 2018, nearly 200 PAWS Chicago adoptions took place at these events. 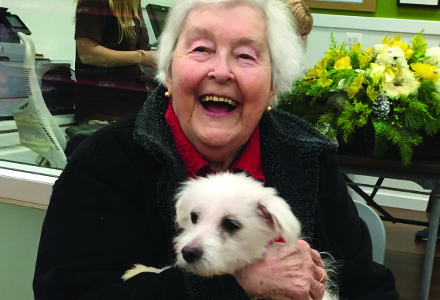 PAWS Chicago also hosted numerous other off-site adoption events during 2018, bringing pets to high-traffic shopping centers and retail stores where people will stop, play with the animals and consider adoption. A PAWS volunteer happened to be at the city pound when a backyard breeder was turning in nine Maltese dogs covered In filth with matted fur and skin infections. The breeder would reach inside and pull out each dog for processing, grabbing by whatever she could reach, hoisting them by a leg or their scruff. They ranged in age from four to 11 years old. PAWS immediately stepped in to save these mistreated pets. Once at our Medical Center, our veterinary team began treatment. Six of the nine dogs suffered from luxating patella (dislocated kneecaps). Others had heart murmurs, cataracts, and severe skin and dental issues. Today, they are enjoying the loving, permanent homes they deserve. Congratulations to Andrea, Theresa, Sue, Brad, Sandra, Alexis, Ivan, Kristina and Paul (in photo with adopter Nancy Anderson) on their special adoptive families.